Each month from September through June, The Cherry Hill Sun will choose one athlete from Cherry Hill High School East or Cherry Hill High School West as its Athlete of the Month. 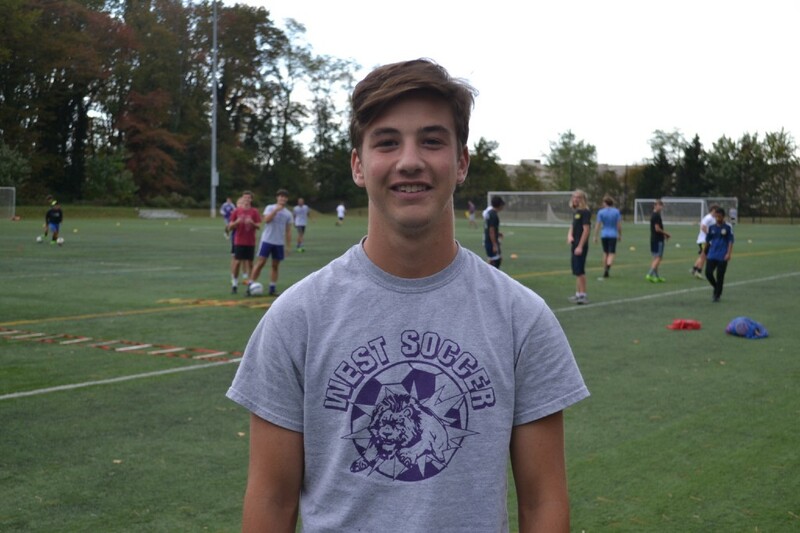 This season, Cherry Hill High School West boys soccer senior captain Jason Kahan is second on the team in goals with 10 and leads the team with 10 assists. However, those statistics only measure some of the value Kahan brings to the team. Head coach Dan Butler believes Kahan’s vision of the field makes him a complete playmaker. Kahan’s play at midfield for the Lions has driven the team to back-to-back winning seasons. Last year, Kahan helped Cherry Hill West win the South Jersey Soccer Coaches Association Tournament and the Olympic Conference National Division. This year, the Lions are entering the South Jersey Group III playoffs with a 9–7–1 record, with Kahan again providing leadership. Kahan began playing soccer with Cherry Hill Soccer Club at the age of 8. When he turned 11, Kahan began playing at the club level. He has played for a number of club teams and currently plays for Real Jersey F.C. based out of Medford. Kahan spent his first season at Cherry Hill West playing on the freshman team. Kahan moved up to varsity for his sophomore year and vividly recalls his first career start in 2015. Kahan spent most of the 2015 season developing and getting used to the speed of the high school level. He continued to improve throughout the season, setting the stage for what would be a breakout 2016 season his junior year. Last year, Kahan exploded offensively, scoring a team-high 18 goals and chipping in four assists to help lead the Lions to a 20–3 season. This year, Kahan’s offensive numbers have featured fewer goals, but more assists. As of Oct. 26, Kahan had tallied 10 goals and 10 assists. After tallying just two goals in September, Kahan caught fire in October. He scored four goals in the Lions’ 6–0 win over Camden Catholic High School on Oct. 4. That performance kicked off a five-game goal-scoring streak for Kahan. Butler has seen Kahan develop in a number of ways this season. He feels Kahan has grown as a leader and is committed to helping his teammates improve. Kahan and some of his teammates who played on the 2016 team have a chip on their shoulder entering the 2017 playoffs. Despite Cherry Hill West’s outstanding record last year, the Lions’ season ended on a low note as the team was upset in the South Jersey Group III semifinals in an overtime loss against Hammonton High School. The Lions have played very few games in the second half of October. Prior to hosting Cinnaminson High School on Oct. 26, the Lions hadn’t played a game since Oct. 16 against Bishop Eustace Preparatory School. However, Kahan believes the extra practice time has helped the team gain confidence. “Once our confidence is up and once we start playing together, we’re a force to be reckoned with, especially late in the season,” Kahan said. Kahan is undecided on where he will attend college after he graduates high school next June. However, he does plan to pursue an education degree.